WC5(2003) 6.3g/l 3.66pH .3% 14.4% Dill Pickle nose, cooked veg in taste briefly, but balance perfect, Still improving, not overoaked, should aerate and let sit another year. Not ready to dump. Probably disulfides which should not be helped by aeration but, we generally put in less oxygen than we should so it won't hurt to do. Aeration should help short term which means that this wine should be tried after aggressive decanting. It may be O.K. if drunk after such decanting. Barrel Titratable Acidity pH Taster's notes M.H. .4 g/l added after measurement. 90g total. 11/3/05 The Wine was analyzed pre bottling: Specs are all in range although the pH is on the high side. I decided to let WC5 age longer but bottle CV58 which tastes a little better than the WC5. WC6 WC 6.25 g/l 3.93pH 14.2% Good solid wine will age nicely. WC5 Camalie/WineCoop 45/15 6.16 g/l 3.9pH 14.3% Drinkable, balance fine, mid hole , bitter finish. 8/13/05 We Bottled Barrel CV3 which belongs to the Wine Coop. Gary and Tim took away 4 cases -1 bottle each Mike Jawetz one and Mark one. Sometime around June I did a major overhaul of the Camalie wine to remove the sulfide odors and associated taste defects. See my notebook for details. 11/30/04 Acidity and pH measured on a relatively cool day in the garage. 51F. Barrel Vineyard Owner T.A. pH T.A. pre M.L. pH pre M.L. The wine in barrel CV3 is coming along very nicely. It has picked up the most oak due to the smaller size of the barrel even though it is second time around for this barrel. Probably has seen a little more oxidation as well due to the smaller volume. 1/12/04 Wine Accounting. Including all 2003 vintage wine, in barrels and in glass for topping. Wine Coop: 112 gal. = 101 gal. in barrel + 11 gal. topping Should produce 40 cases. Target volume for the wine coop wine was 102 gal at this stage so we are about 10% ahead of plan mostly due to the lies being more compact this year than last. 1/10/04 9:30am. We carried 4 barrels down into Tim's basement and then pumped the wine to them through 200ft. of hose stretching from Holler's Garage, across Gary's back yard. This took two hours and 40 minutes of pumping time plus lots of additional logistics including lunch which brought the whole endeavor to about 5 hours worth of work. The walkie talkies were invaluable for coordinating the wine flow but, we still had some overflow in spite of the Seanster's warnings. Glista made us some wonderful sandwiches(:-) to sustain us through the endeavor. Tim's sons John and James helped us carry the barrels down the steps saving some of our more delicate backs. Glista's decorations including table, chairs, and artwork make the Guilford's Wine cellar/tasting room most inviting. I look forward to many enjoyable barrel tastings there. WC6 mfg.-Mendocino Oak - , French Oak, 225 liter, Medium Toast, toasted heads, 24 mo. aging. New barrel, 20FXM stamped into end. CV58 mfg. Mendocino Oak, American Oak - Northern, 225 liter, Medium Toast, toasted heads, 24 mo aging, New Barrel, 11XM stamped on end. WC5 mfg. Quintessence, French Oak, 225 liter, Medium Toast, Barrel held 2002 vintage for 12 months. CV3 mfg. World Cooperage, 2001 vintage in it for 6 months, has been dry since but, sulfur wicked periodically. 1/10/04 8:00am To address the sulfide and mercaptan problem in the with Camalie wines we added .1ppm of Copper Sulfate to the Camalie Wines. We pipetted 1% Copper Sulfate solution; 8.4ml into D, 6.2ml into E and 6.6ml into tank F. Later in the day as we were racking the wines to the barrels Gary and Tim commented several times that they had noticed no sign of the the sulfide smells as the wine was racked. 1/9/04 5:00pm The barrels were filled with water to allow the wood to swell and seal any residual cracks. The barrels leaked slightly especially on the ends for the first couple hours. 1/9/04 We repeated the sulfide compound discrimination test on samples from tank E with Gary and Tim evaluating the smells as well as Cindy and I. We had roughly the same results as for tank F on 1/6 although they were a little more ambiguous. The sulfide smell in Tank E was not a bad as it was in Tank F. Bottom line is that the addition of copper sulfate should solve the problem. 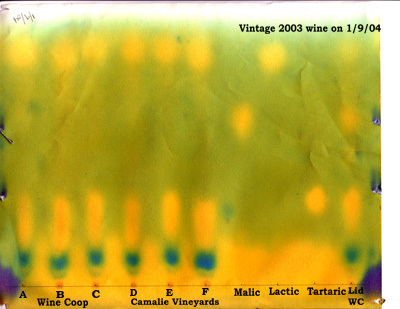 1/9/04 A chromatograph was run on the wine to determine the progress of the Malo Lactic Fermentation. Here is the graph. The way this chromatograph works is that it shows which organic acids are present in the wine samples. The yellow spots indicate the presence of an acid. The samples are dabbed onto the paper at the bottom of the sheet along the line where the labels are. The paper is then placed in a jar with a few millimeters of solvent on the bottom which then wicks up the paper by capillary action carrying the acids along with it. The lighter acids get carried higher. Three reference acid samples are used toward the right side of the paper to show at what height each acid should appear, tartaric is lowest, malic in between and lactic at the top. If Malo-Lactic fermentation is complete all of the malic acid will have been converted to lactic and there will be no malic acid spot. From the graph above you can see that tanks A-F have no Malic acid present and have completed M.L. fermentation. The wine that overflowed onto the lid of tank C has not completed M.L. fermentation most likely because it was sulfited to reduce the chance of a microbial contamination after it overflowed onto the lid. 1/6/04 Sulfide smell still very bad and taste affected as well in the three tanks of Camalie wine. The Wine Coop wine shows no sign of sulfur at all. Cindy acquired a sulfide compound test kit from the Wine Lab and we ran a test to determine which sulfur compounds the wine has. We did the test on tank F. The results of smelling the wine after the chemical additions to samples in glasses indicated that we have H2S and mercaptans but no disulfides. 12/20/03 To address the high sulfide content of the Camalie Wines tanks D,E and F were aerated for 5 minutes each using the output of my small vacuum pump pumped through a hose attached to the end of a spoon which was gently stirred through the top half of the wine. Disturbing the lees was avoided. 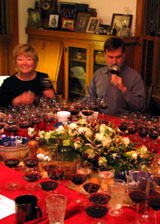 12/13/03 We blind tasted all of the 2003 tank wines, WC5 from 2002 and another 5 commercial wines. Here is the scoring. Gary's take on the evening. A few conclusions from these results. The 2003 Camalie wines clearly have a problem with a sulfur in the nose. I will try some aeration to see if this can be reduced. Since this difference is observed across all of the tanks it appears to be related to the grapes. However, the Camalie tanks all have more wine in them than the WineCoop tanks which would result in less air contact per volume than the WineCoop wine received. Aeration during fermentation usually reduces the hydrogen sulfide smell. These wines were decanted however, with significant aeration which did not eliminate the sulfide smell. There are actually two different sulfur smells. One is Hydrogen Sulfide (rotten egg smell) and the other is Sulfur Dioxide (burnt matches smell) Aeration eliminates the Sulfide smell primarily. I think most people detected the matches kind of sulfur smell which could come from the sulfite added to the wine or something else. I need to do some research here. B and C into new French Oak barrel. Same grape, yeast and oak configuration as WC5 2002. .9 x 65gal. A and E into the WC5 French Oak Barrel. .9 x 75 gal. This would be a hybrid barrel. 7 gal leftover plan B would be to put A into a half barrel by itself. This would leave 4 gallons for topping the WC wine which could be bottled. F into a 26 gal. half barrel .9 x 44 gal. 13.6 gal leftover. In plan B tanks E and F would go into the WC5 barrel. .9 x 85 = 76.5 gal. 16 gal leftover, 10 into a barrel with D and the remaining 6 gal. for topping. Unless I can get a handle on the problem with the Camalie wine with high confidence before we rack in January I am in favor of going with plan B. Even if I am able to aerate and fix the Camalie problem plan B still looks as good as plan A. The only benefit of plan A would be to allow Tank A to go into the new American Oak barrel rather than a 2001 half barrel. Thoughts on ripeness and adding water. Articles from Wine Spectator and The S.F. Chronicle. 11/20/03 We stirred the 2003 vintage in the tanks to distribute the M.L. bacteria which appeared to be thriving in large colonies on the surface. The colonies were significantly smaller in tank D for some reason and the smell is not good in this tank. This tank contains the largest volume of wine of any of the tanks. Tank D is primarily Camalie Wine. M.L. fermentation uses a bacterium to convert any remaining Malic acid to Lactic acid which is more stable. If this M.L. fermentation happens in the bottle it gives off CO2 which creates a carbonated Cabernet, something to be avoided. Nov. 3, 2003 Wine Analysis done on all Lots and M.L. Fermentation initiated. The wine is pretty much textbook parameter wise at this point. The low acidity measurements observed just after fermentation was initiated may have been a measurement problem. Acidity is on the high end of the range which is where it should be before M.L. fermentation. M.L. will bring down the acidity as it converts the stronger Malic acid to the weaker Lactic acid. Data below was taken 11/3/03 am before M.L. innoculation, right after pressing. D 56.4 7.5 3.77 .4 13.9 16 gal of this is wine coop. B 52.8 gal. 36.8 gal. .69 3 gal became "lid wine". C 52.8 gal. 35.1 gal. .66 3 gal became "lid wine". Oct. 26, 2003 Lots B and C lids put down on top of the must prematurly by M.Holler forcing 6 gallons of wine out onto the lids. Camalie will replace these 6 gallons from its wine, hence Tank D now contains 16 gallons of Wine coop wine instead of 9.2 gallons. The 6 gallons will continue to be processed in parallel in a carboy. I now consider it Camalie wine. Sorry about this. I should have known better. Oct. 25, 2003, Pressed off Lots A,D and G. Here are the volume numbers and the yield. Lots D and G were combined into Tank D to get the wine out of plastic tank G and also to increase the wine to lies volume as the lies settle. The total in tank D is now 56.6 gal. 9.2 gal. of which belongs to the wine coop. Based on a yield of .67 my projection is that after we press the remaining wine in tanks B,C,E and F we will end up with 243.9 gal. of wine which is almost exactly 4 barrels worth. I believe we will fill 3 full barrels and one half barrel and use the remaining 35 gal. of wine for topping. Oct. 23 First alcohol measurements done on the Cepage lots that are through fermentation, A, D. Alcohol levels in both lots were 14.1%. Plans are to press 2 or all three of the Cepage lots this Saturday, 10/25/03. October 20, 2003 Progress Report: Thanks to Gary Bacon for this report. The wine fermentation process is moving along on schedule. Varied levels of nutrients (Superfood, DAP, and vitamins) were added on 10/15/03 to stimulate fermentation. The conversion of sugar to alcohol will be complete when the specific gravity reaches 1000. We are very close to our target. For those who have forgotten their chemistry terminology, specific gravity is the heaviness (density) of a substance compared to that of water, and it is expressed without units. A sugar solution has a higher specific gravity that alcohol. To calculate specific gravity, one could divide the mass of a material in grams by its volume in cubic centimeters. We simply use a calibrated flotation device to obtain our readings each time we punch the must. The temperatures of the vats started in the high 60s at the beginning of the fermentation process and have progressed to the high 70s and low 80s (as they should). Data above and below was taken on 10/15/03 two days after yeast innoculation just as fermentation was getting started. Sulfite had been added on 10/12 late. 9/23/03 The grapes seem to be catching up rapidly after 7 days in the 90s over the last two weeks. See the outside temperature trend chart for Camalie Vineyards below. Looking at the Ripeness curve below It now looks like the grapes will be ripe on 10/11 or a day or two before if the target is 24 Brix. A straight line is probably not the best fit with the weather expected to cool over the next week at least. If anything the ripening rate should slow down which would tend to push harvest back toward 10/11 or later. Rich Poliak embarrassed me into making an excel plot of the ripeness. The hand drawn graph is gone. 8/30/03 I went out into the vineyards both Camalie and Domaine Chandon and discovered that the grapes are ripening very slowy this year, roughly 2-3 weeks slower than the last two years as you can see from the graph below. Note I have just plotted the 2002 and 2003 data on my 2001 graph. As a result of the slow ripening our harvest party schedule has been pushed out by 3 weeks to 8/18.